So, I read 50 books in 2018. What surprised me was how easy it turned out to be. I’m not saying that it wasn’t work or that I didn’t have to try, just that I expected reading 50 books in a year to feel more like climbing a mountain and less like a series of day hikes. It also had a weird side effect: I’m more inclined to quit a book mid-way through. This really threw me off, because I figured that needing to hit such a big goal would make my total book count feel more sacred, each completed book more valuable. But reading so many books back-to-back just taught me that certain books aren’t worth my time, and that if I’m not into something I shouldn’t even bother. This means that going forward I’m more likely to set smaller goals for the number of books to read in the year. Not because I won’t read a lot, but because I have a feeling I’ll want to abandon so many. 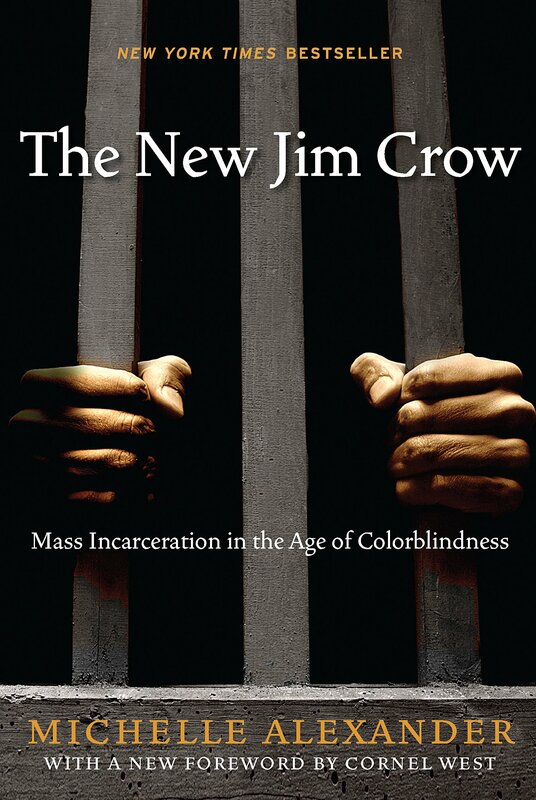 This was a difficult and perfect book to quit early, because there’s nothing wrong with it. It’s a fine book and interesting enough, but after a few chapters I realized that with a TBR that’s four years long, there’s really no reason to read anything that’s just “interesting enough” unless there’s some outside reason to read it. And there was no outside reason to finish this book. I’ve always wished I was the kind of person who went running for fun. Additionally, this book is secretly about writing. The forth book in the Uglies series is a real departure from the previous three, so it got mixed reviews. People were expecting a continuation of the same story with the same people, and instead they got a new protagonist, new characters, and new tech. But I already knew all that going in and couldn’t be disappointed in the same way, so as far as I’m concerned this book is just as good as the first three. I picked up this book at an author event in Seattle. I got to meet Maureen and have her personalize my copy. I took it home and started reading it the very next day. Ironically, I would have done better to let this particular book sit on my shelf for a few years. I didn’t realize it was meant to be Book One of a series, and my only complaint is that it ends on such a cliffhanger that I wish she had waited to publish until she had the whole thing done so I could keep going immediately. Done. For the fifth time. I actually started this book years ago, really loved it, but somehow never finished. In finally finishing it I realized that the reason I probably quit was the elements that interested me most started to disappear after the first few chapters. 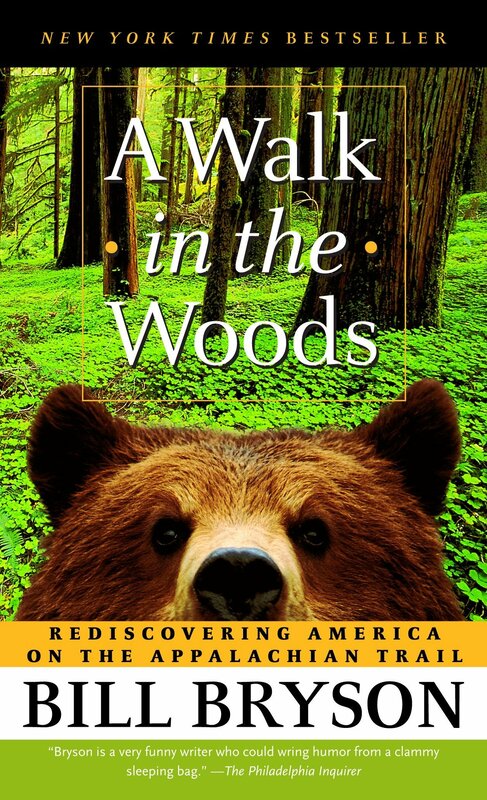 Because there’s a bear on it and they never actually encounter a bear. Also I don’t think the quality of the combined images is very good. This was a cookbook that I got as a gift. I’ve found that I just don’t use cookbooks as much anymore, preferring to cultivate my own as I find new recipes. I briefly considered getting rid of all my cookbooks in the same moment, but most of what I have holds sentimental value. Plus I still enjoy having a couple classics around like The Joy of Cooking, Better Home and Gardens, and Betty Crocker. Managed to do this pretty early, as I was already two books behind by February. I got all the way up to five books ahead of schedule right after BookTubeAThon in August. I never got around to reading any Stephen King. A friend asked if I had a top three recommendations from my year, which is difficult both because I read so many great ones, and because each book fulfills a slightly different need. I set a comparatively low goal for 2019 (just 25 books), but hope to overtake it by quite a ways. Whatever your reading goals are for 2019, I hope they make you happy and I wish you the best of luck! 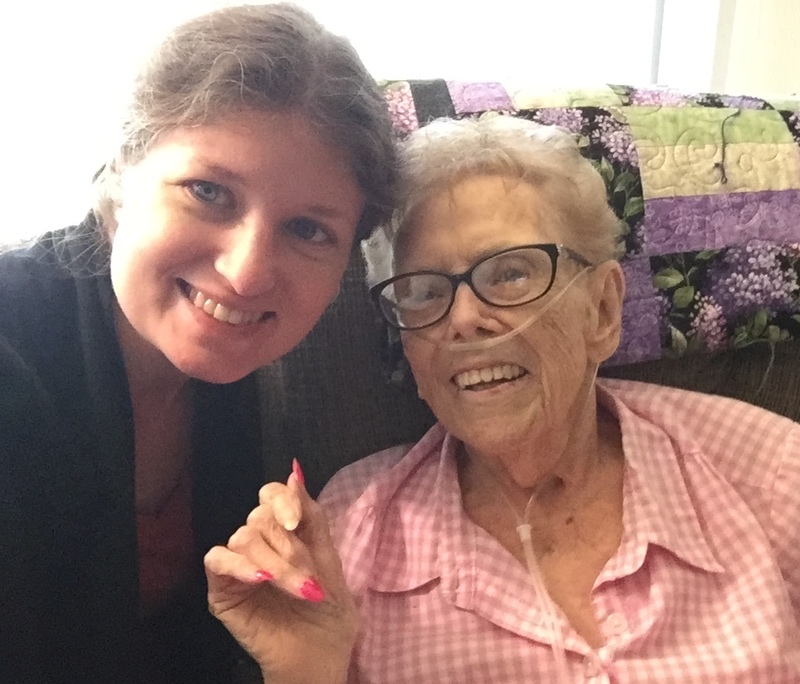 One month ago my maternal grandmother, who we always called Nonnie, was put into hospice. This was as much a logistical decision as anything, since it allowed her to go home with the oxygen and pain meds she needed, rather than being stuck in the hospital. It wasn’t clear whether or not Nonnie was all that close to death. My mother said it could be a while still or it could be any day. My parents suggested it might be a good time to go visit her in California. I looked at my calendar. There were three feasible weekends in the coming months where I could make a trip to California work: October 20th, November 10th, or December 1st. The weekend in October was certainly the least convenient as I was pretty busy, and I’d have to get all the arrangements in order very quickly. But I chose it because if I waited just out of convenience and Nonnie died before I saw her, I knew I’d never forgive myself. It turns out I did the right thing. Nonnie’s driver, the woman who’d been taking her on errands and to hair appointments for a long time, came by to pick her up today around noon. While they were getting ready Nonnie passed out in her apartment at the retirement home, and never woke up. My trip in October was a short one, but I got to spend a full day and a half sitting next to my grandmother and asking her questions. Some of these questions gave more fruitful answers than others. I wanted to know more about her and my grandfather’s love story and how two people can stay happily married for nearly 70 years, dedicated to each other until the very end. When my grandfather got dementia, he slowly forgot who all of us were, where he lived, or what was going on at any particular moment. But for years he still didn’t forget Nonnie. She’d go to the bathroom and within a minute he’d be asked about her, wanting to know where she’d gone. He died about two years ago, and Nonnie told me she’d been asking the Lord to take her ever since. I was working at the air force base and he was a pilot. I went to the water fountain to get a drink and that’s where I met him. How did you start dating? The next day he asked me for a date and I said yes. How did you decide to get married? He was going to go out to visit his family in Ohio and said he wanted me to go with him. I said I wasn’t going anywhere with him unless we were married. So he said let’s get married, and we did. “So you could either be happily married or unhappily married,” I suggested. “That’s right,” she told me. I had a wonderful day and a half with my grandmother. I wish my boyfriend could have gotten the time off work to visit, I wish my sister could have come down as well. But I’m also happy I had that time just for the two of us. It was like when I was little, and Nonnie and Papa would drive their RV up to Seattle and park it at my parent’s house for the entire summer. I’d wander out there and sit in the RV with Nonnie, watching soap operas and learning how to do yarn cross stitch on plastic canvas. I’d fiddle with the rings on her fingers and she’d ask if I wanted any of them when she died. I always thought this was a silly thing to ask, since I knew (correctly) that Nonnie wasn’t going to die for a very long time. But it was also silly because I didn’t really care about the rings. I just liked to touch her hands. They were smooth and cold. Her skin was thin and her nails were always professionally manicured. My whole life I’ve always kept my nails long, only trimming when they get so long that they’d break if I didn’t do something. I keep them that way because I love them that way. I love them that way because of Nonnie, and her cold, soft hands, and her perfectly manicured nails. This year I experienced a BookTubeAThon miracle. I read eight books in seven days. Longtime readers of this blog will know that every year I create a spreadsheet outlining which books I plan to read and how many pages they all are. I use that to plan out my week. I do this because if I don’t have a clear number goal in mind, I will always give up early and decide I’ve already done enough work for the day (this is true for more than just reading marathons). So I use my spreadsheet to figure out the number of pages I need to read each day, then I make a plan for what I’ll read when. Everything was going according to plan until Wednesday, when I stayed extra long at a work party and completely missed my daily goal. I figured I would just make it up in the second half of the week (I tend to front-load my plan for just this reason), and set to work reading on Thursday. And then, somehow, it was Saturday afternoon and I realized I would easily finish the last two books on my list before I needed to go to bed. While I suppose I could have taken this as a sign that I should slow down and do something other than read for a little while, I instead decided it would be exceptionally satisfying to say that I once read seven books in six days. And then I realized that there was a copy of Breakfast at Tiffany’s and Three Stories on my desk, which was intended to be the book I read after the challenge was over. But it’s only 142 pages – well below the number of pages I’d been averaging. So on Sunday morning I picked it up, and even with going to church and watching a movie, I was still done by 11PM. I’m calling it a miracle because I still don’t totally understand how it happened. I have a spreadsheet detailing my original plan as well as the actual pages read every day, and I still don’t get it. There’s math and yet I can’t really tell you what happened. The numbers of course clearly illustrate how I read 1553 pages in seven days, and yet somehow it doesn’t add up. I just read. A lot. The Underground Railroad was about as cheerful as you would guess an American slavery story to be, but it was also extremely well-written and imaginative. But I suppose if you win a Pulitzer Prize you don’t need the stamp of approval from people like me. 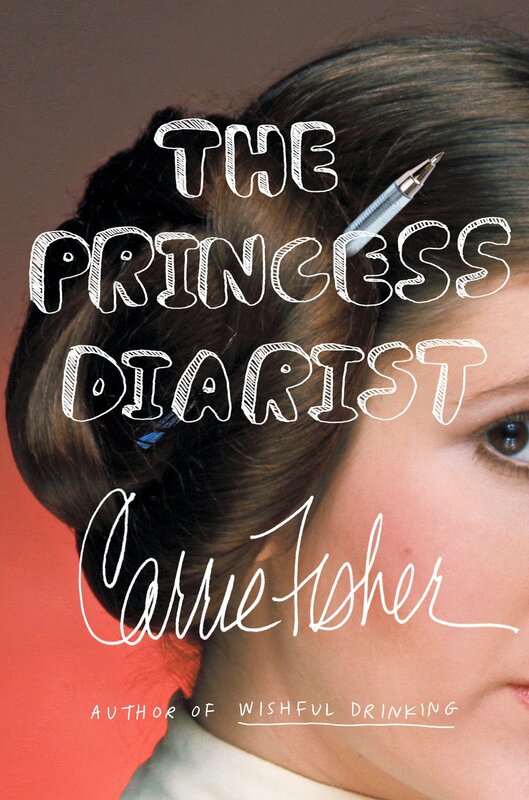 The Princess Diarist was lovely. Half of it is Carrie Fisher casually telling you stories abut her life, and half of it is excerpts from the personal journals she kept as a 19-year-old working on the set of Star Wars. The journal entries are about as angsty as a teenager’s journal ought to be, but they are also beautiful and poetic. It’s like every line is your favorite Death Cab for Cutie lyric. I listened to it on audiobook from the library but I want a copy for my home, so this book is definitely going on my Christmas list. Mooncop is a wonderful and bittersweet little graphic novel about the last police officer on an out-of-vogue moon colony. It probably took me all of ten minutes to read and I loved it. This was my only “cheat” book of the week. Fly on the Wall is about a teenage girl who wishes she could be a fly on the wall of the boys locker room and then literally becomes one. It’s a fun little book and has some nice messaging when it comes to race, sexuality, and body image. Recommended for readers under 15 or anyone who just wants to feel good about life for a little while. A is For Alibi was a little disappointing, but since disappointment is a direct result of expectations that may have been my fault. I think I was expecting something a little more complicated and thrilling. I do agree that the detective character, Kinsey Millhone, is a great personality to build a series on. So I understand how Sue Grafton was able to write 25 books about her. What I Talk About When I Talk About Running was an audiobook I had on hold with the library that finally became available in the middle of the week. 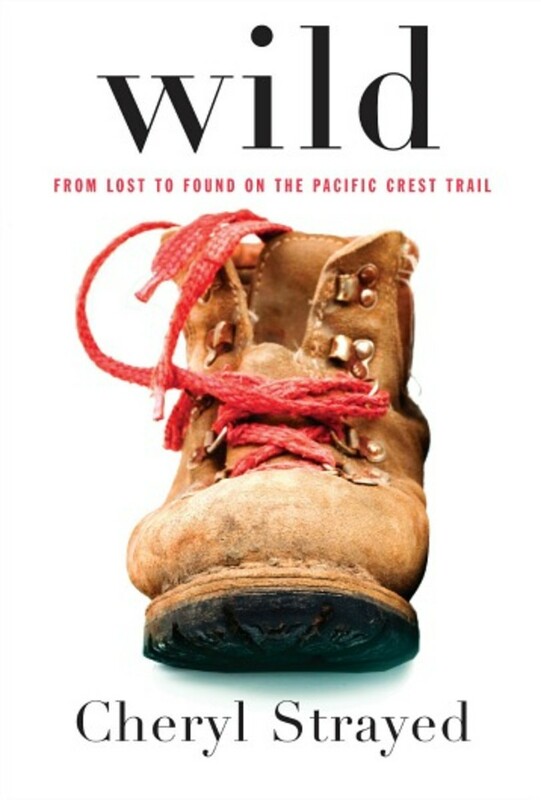 I decided it could be my book about “something you’ve always wanted to do.” I’ve always wanted to be a runner. I don’t really want to run exactly; I actually hate running. I’ve just always wished I was that type of person, the type of person who trained for marathons and got intense zen satisfaction from a two-hour run. I’m not that person. But I am a writer just like the book’s author, Haruki Murakami. He talked about writing and running interchangeably, and it was interesting hearing how he viewed each. Fight Club was a strange experience. I read the book and then re-watched the movie to compare the two. Most of the movie was an extremely faithful adaptation of the book, something that is very difficult because of the intentionally chaotic way the book is written. I found myself seeing the movie scenes in my head as I read, and by the end I actually questioned how the movie ended, because I could see Edward Norton so clearly in the book’s ending. I never really liked the ending of the Fight Club movie, and I think the original is far superior. But somehow reading the book gave me a better understanding and appreciation of the movie, including its ending. Breakfast at Tiffany’s was a different experience. The parts of the movie that are faithful to the book are almost word-for-word readings. But then there are entire plots added and dropped along the way. The truly shocking thing is that not only does the book not end as a happy romantic comedy, it’s not a romance at all. Holly and the narrator never have any sort of love affair. He’s clearly infatuated with her, but nothing ever comes of it and in the end she leaves him, and New York, forever. What was even more surprising is how small the character of Yunioshi is in the book, and how racially progressive. In contrast to Mickey Rooney’s racist caricature in the movie, when Yunioshi is described by a bartender in the book as a photographer “from Japan,” the narrator corrects him to say, “from California.” It’s hard to say how racially progressive the rest of the book is, because it suffers from some dated racial language that is hard for the modern reader to separate from prejudice. It’s certainly sexually progressive, with Holly Golightly being a self-described bisexual and suggesting that everyone is bi to some degree. Because of my BookTubeAThon miracle I ended up five books ahead in my goal to read 50 books this year. I’ve been behind since February, so it feels good to not only be on track, but to have some wiggle room. Since I can’t attribute this year’s success to anything in particular, I’m not sure if I should build on it or not. Since I only had one tiny book and I ended up reading an extra one, it means that for the first time my seven books were really, truly, books. Yes, books like Fight Club and Fly on the Wall are short. But The Underground Railroad and A is for Alibi are not. Do I try for seven real books again next year? I’m not sure. I will say that on par with reading eight books in seven days was getting BOTH of my parents and a family friend to participate in BookTubeAThon. Which means no matter what I do next year, for 2018 I can take credit for 29 books read in a single week. BookTubeAThon 2018 is almost here! For those of you who don’t know, BookTubeAThon is an annual reading challenge where participants attempt to read seven books in seven days. Anyone can participate, including you. All kinds of books count: children’s books, graphic novels, audiobooks, whatever you want. And there are seven challenges that everyone tries to accomplish. Watch the full challenge video here. Let a coin toss decide your first read. Read a book about something you want to do. Read and watch a book to movie adaptation. Read a book with green on the cover. Read a book while wearing the same hat the whole time. Read a book with a beautiful spine. 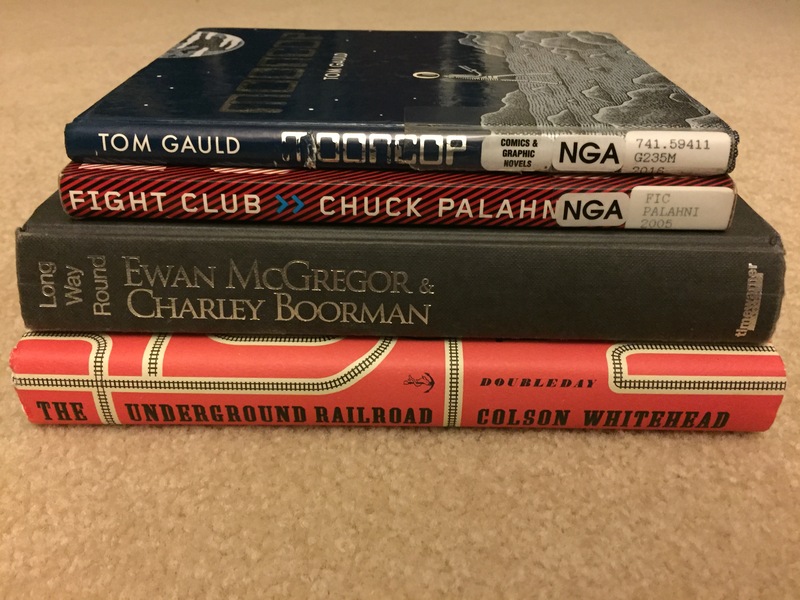 Mooncop, The Underground Railroad, Fight Club, Long Way Round, and Fly on the Wall were all already on my personal TBR, so they were pretty easy picks. Only one of these was on audiobook, and I’ve found that I need at least three audiobooks to have a really effective BookTubeAThon. Unfortunately there was basically nothing else on my person TBR available on audio from my local library, so I started browsing the “available now” section of the library’s audio app to get some more options. I still needed a book with green on the cover (there is absolutely no green on any of the five I’d already found), so I started by just scanning for color. 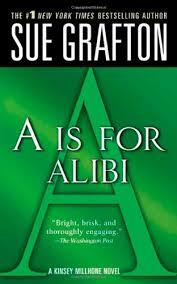 A is for Alibi is almost solid green, and a book I first considered reading only hours earlier. I’d been listening to a beautiful tribute to Sue Grafton on NPR and thought it would be worth reading at least the first book in the famous alphabet series. I wanted an alternative to one of my physical books, so when I saw The Year of Living Danishly I figured a book about living in Europe for a defined but significant time could be on par with a book about traveling around the world in one long trip as something I’ve always wanted to do. So that’s it, that’s my TBR for BookTubeAThon 2018, with my challenge two book to be decided near the end of the week when I know if I need a physical book or an audio one. It’s not too late to pick your own books and join in! The challenge starts July 30th at midnight. Remember, you don’t need to pick seven full novels. For my first BookTubeAThon, four of my seven books were extra short ones like plays and graphic novels. It was still a challenge and still a lot of fun. The worst thing that will happen is you won’t read seven books in seven days, which is exactly what will happen if you don’t try at all. I may be reading 50 books this year. Ever since I discovered reading challenges and Booktube a few years ago, I’ve wanted to have a 50 book year. It’s a very common goal online, and for avid readers it’s pretty attainable. I’m not necessarily an avid reader, but I’ve managed 24 books a year two years in a row, so it’s not an insane idea. However I’ve recently realized that setting goals and sticking with them is only helpful so long as the goals are aligned with your interests. I’ve had a number of occasions where I stuck with a goal for far too long (usually to completion) without acknowledging that I didn’t actually want it anymore. I think I want to read 50 books this year, but more than that I want to read as much as I can while still enjoying it. I don’t want to start reading “cheat books” just to get my numbers up, and I don’t want to push myself to finish something terrible just to say I did. 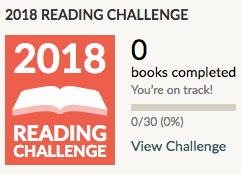 So I’m setting my Goodreads challenge at 30 books, and I’m planning to read three and a half books in January. Assuming I participate in BookTubeAThon and #ReadingBingo again this year, three and a half books a month will get me to 50 and then some. So if January feels good, I’ll up the Goodreads goal a bit. If I still feel this way in a few months, it will go to 50 books. Part of what I like about reading challenges is the way it gets you to switch up what you might normally reach for, so I decided I wanted to have a challenge list for this year as well. But in the spirit of setting goals that are aligned with my interests, I wrote my own list. It is purposely not 50 items long, and I’ll probably double up on some anyway. This way I never have to refuse a book I want to read just because it’s not on the list. If you’re looking for a challenge I’d love for you to try mine. Or better yet, write your own. By the time we got to the high school to help clean up, almost all of it had already been packed away. There were no extra chairs, no screen, no tables full of photo boards. All that was left was a row of flowers and memorial gifts near the front. 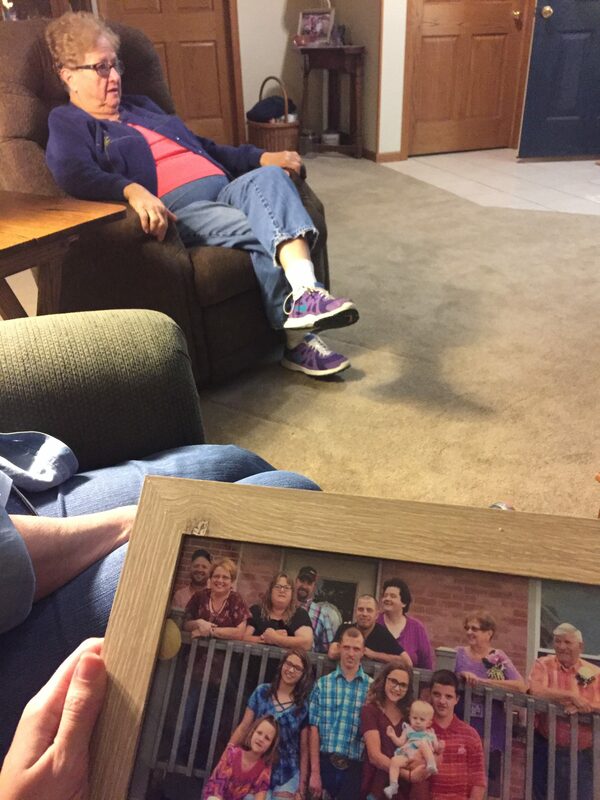 My Aunt Sue introduced us to Pam, Jodi’s mother. We said we thought cleanup wasn’t supposed to start until 10AM, and Pam said, “Well, we couldn’t really sleep, so…” One of the other helpers told me both sets of parents had been there since 8:30AM. We loaded the dozens of vases, baskets, wind chimes, blankets, and memorial stone benches into the cars. Sue and Pam went up to each arrangement or gift to look at the card and determine who should take it home. A gift from Jim’s work would go with Sue, flowers from a student Jodi worked with would go to Pam. Pam said something about having read these cards a million times already. It must be exhausting to make so many decisions that feel significant but are ultimately trivial. Sue wanted to drop a few of the arrangements over at their church, where the casket had been buried the day before. We went out to place the eternal flame stand near the spot and see the freshly dug dirt. 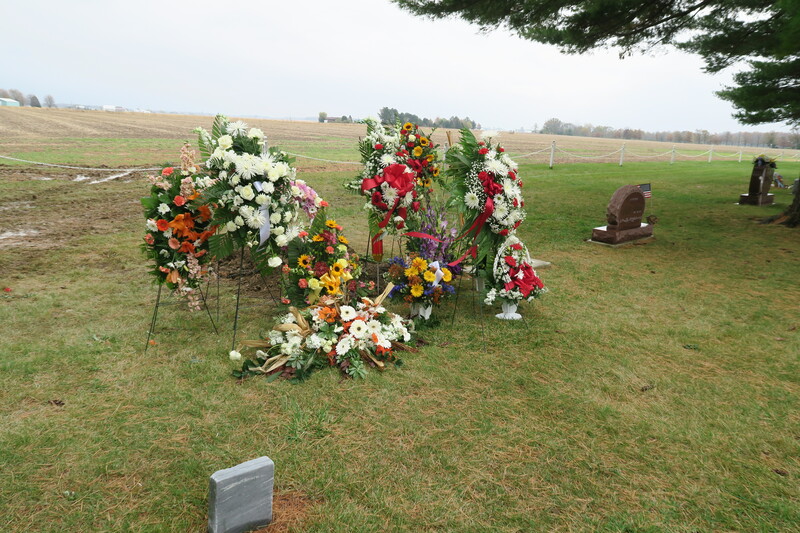 The family was buried in the back corner of the cemetery, overlooking a big open farm field. One of the students Jodi drove stopped by to pay his respects. He is mentally disabled and said he hadn’t been able to attend the service because he gets nightmares easily. His mother said it would have been too much to be there. 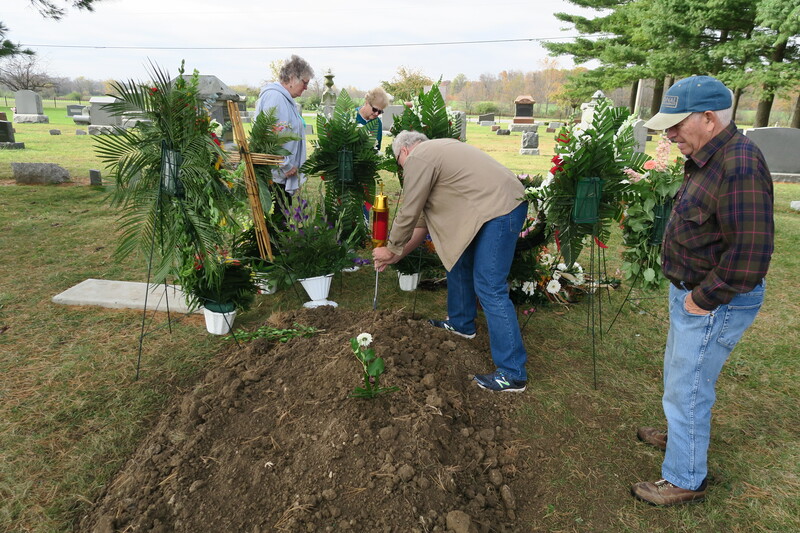 But he wanted to see the grave and honor Jodi in his own way. We went back to Sue and Bob’s house and began unloading three cars full of gifts. We filled the dining room table with flowers. Sue decided she wanted to give some to the nearby nursing homes, and we loaded them back in the car. As I was walking back into the house they were discussing who should help deliver, and I heard Sue say, “And Katrina! Katrina will go with us!” She was very excited to bring me along. I got the feeling she was very excited to have anyone around, and anything to do. Mike, Sue, and I stopped at two different nursing homes to deliver the flowers. We had to drive by Jim and Jodi’s burned down house twice. Both times there were people stopped outside. Sue didn’t like this. She couldn’t help but feel they were all just look-i-loos. At the second nursing home the manager was on the phone when we arrived. She appeared to be having a difficult conversation. “Well no, you’re not nothing,” she said, “He raised you, but you’re still not his biological son, so…” We waited patiently and she apologized for taking so long. The manager smiled, clearly touched by the gesture. “Of course,” she said, “Our residents love fresh flowers. We can put one in every common room.” She came out to get them from the car herself. Mike and Erin had to leave to attend a wedding, and the rest of us sat around chatting for a while. 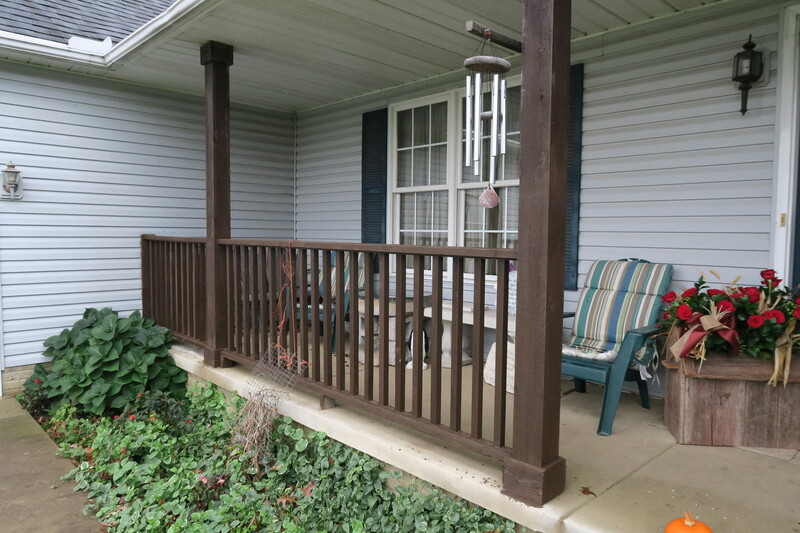 Bob made fun of Sue for being too afraid to get eggs out of the chicken coop. I walked around outside the house and recreated my favorite photo of young Cody from my visit eight years ago. The trees have grown so much since then. Sue and Bob took us down into the basement to show mom and dad the old photos they had of my great grandparents. The partially finished basement is full of stuff, from boxes of VHS tapes to antique furniture my cousin Erin would like but Bob swears they’re “still using it.” There were piles of stuff that belonged to Sue and Bob’s three boys, left from the broken rule that they would take all their stuff out once they each had their own home. We came across some old boxes of farm toys that Cody, Austin, and Jessica used to play with. We had sandwiches at the house and got in the van for a little drive. As we were leaving one of the chickens wandered into the garage, and Bob asked me to get it out. I ran after it, making noises and flapping my arms. My mom thought my tactics were pretty entertaining. I told her everything I know about chasing chickens I learned from Austin and Cody. To start our drive we went to see my cousin Andrew’s new property, then through Fostoria to see the flour mill where Jim worked. 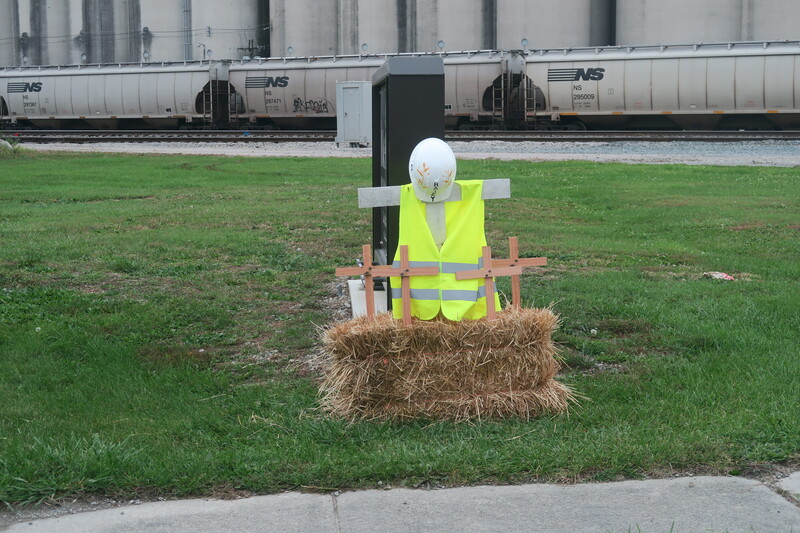 They’d put up a memorial cross by the sign surrounded by four small crosses, and dressed it up with Jim’s safety vest and hat. Next was the Chestnut Grove Cemetery, where my great-grandfather Howard Rainey is buried with his second wife, Helen. 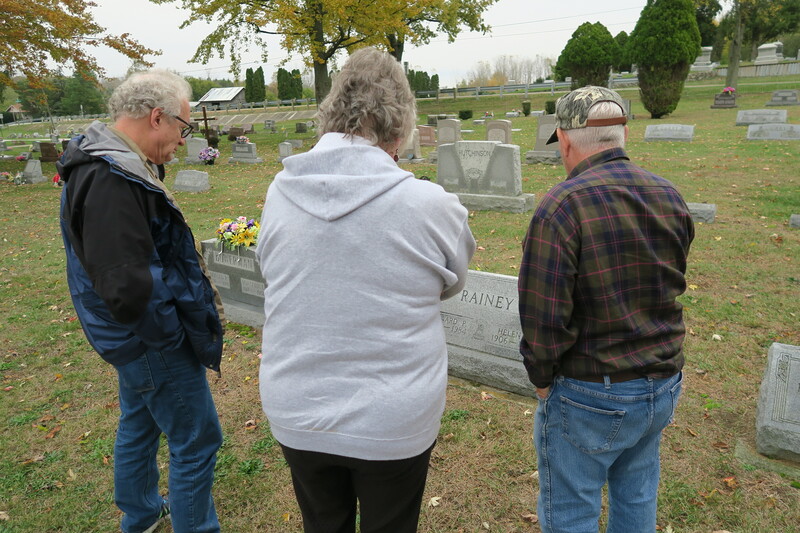 My family line is through his first wife, Nina, who is buried somewhere in Fostoria. Sue couldn’t remember where exactly, and with both my grandfather and my Great Aunt Jean gone, I’m not sure anyone knows anymore. At this point we’d been driving around for over two hours, and Sue told us it was so nice to have a reason to get out of the house. We still had time before dinner so we stopped by Bob and Sue’s old farm in Republic, the one I visited back when I was nine. I’ve kept a memory of that farm in my head for over 20 years, and it looked exactly the same. Smaller, I suppose, but otherwise just the same. We arrived at the Tackle Box 2 (so named because the original Tackle Box burned down), and my dad and I split a pound of fried perch. My parents were hoping to pay for dinner, but Sue insisted she and Bob would. Her voice started to crack. “It’s just meant so much to us to have you here,” she said. Both her and my mom started crying. I’m so glad I came back to Ohio. We slept in until 10:30AM this morning. My folks and I got dressed in the nice but dark clothes one generally wears to funerals, and headed out to get a late breakfast at a nearby diner. We drove through the tiny town of Bascom to get to Hopewell-Loudon, the school where almost every Rainey in Ohio graduated high school. Jim and Jodi’s oldest child Austin had only graduated this year. Cody had just started the 10th grade, and Jessica was a first grader. The service wasn’t until 3PM, but we came early because there was “a visitation” in the gym from 10AM to 3PM. I’d never heard of a visitation before, and my mom suggested they must be calling it that because a formal viewing would have been impossible. The fire that killed the Raineys was so hot firefighters hadn’t even been able to enter the building when they arrived. It was hours before they were able to recover the bodies. With the exception of Austin, all the family members had to be identified using dental records. We pulled up to the school and found a firefighter in uniform directing traffic. As Sue had instructed the night before, we told her we were with the family and would be in the procession to the gravesite later. She pointed us in the right direction, and we parked in a line of cars right outside the gymnasium. We followed a line of Hopewell-Loudon marching band members in formation as they entered. The lobby was full of flowers and photo boards, as well as a therapy dog that had been visiting with students all week. 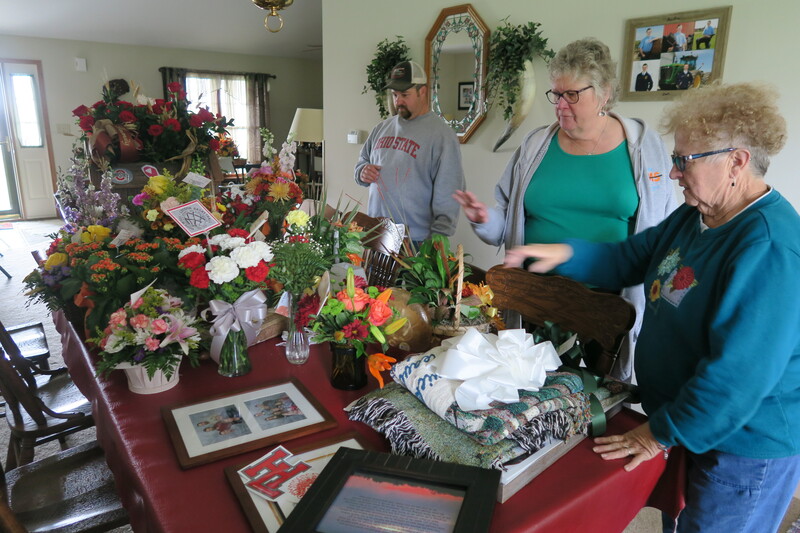 Flowers and gifts had come from every corner of the community: the auto shops, the Wells Fargo employees, the firefighter’s union Austin had only just joined. The marching band went into the gym and to the front to play a song in remembrance before taking their seats in the bleachers. A single casket was near the front, the remains of the entire family hidden inside. My parents and I said hello to Aunt Sue and Uncle Bob, then we put our coats on a few of the chairs reserved for family. I’m really sick of having reserved seats at funerals. The next two hours were a mix of looking at photos and re-introducing ourselves to distant relatives. 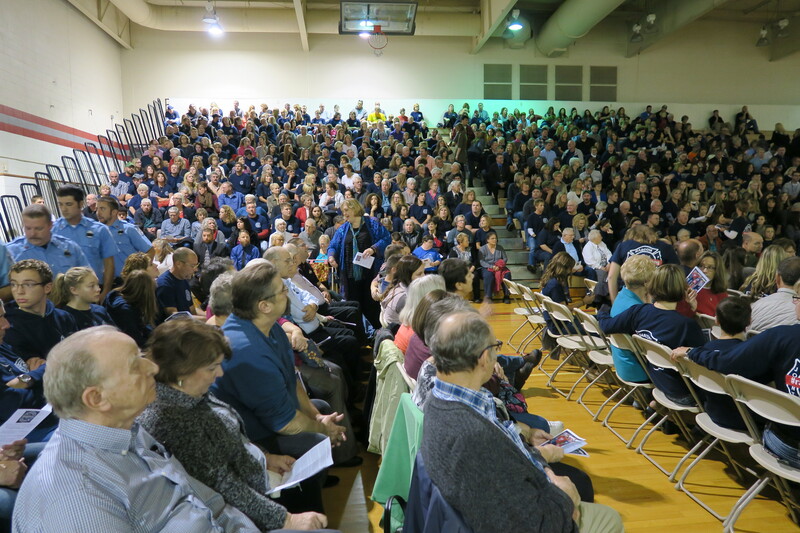 All around us people were wearing matching navy blue t-shirts with the firefighter logo and the hashtag #RaineyStrong on the back. 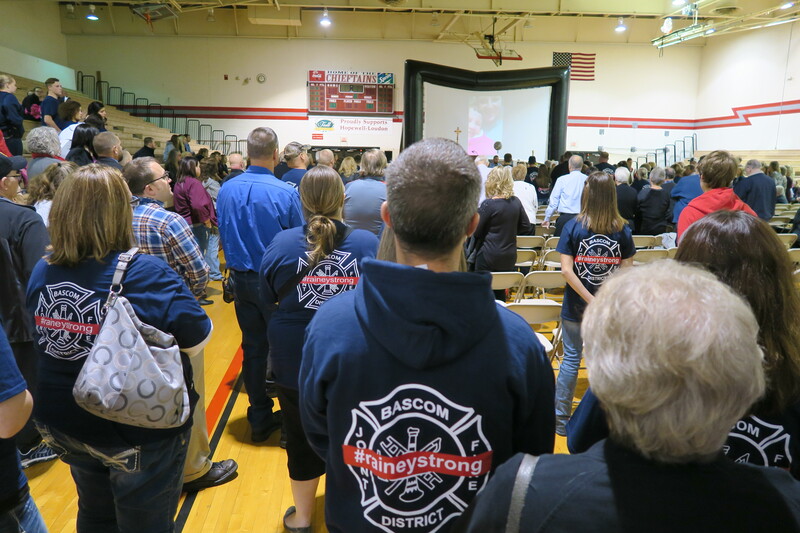 Austin was a cadet for the Bascom Volunteer Fire Department, but they treated him as though he were any other fallen firefighter. 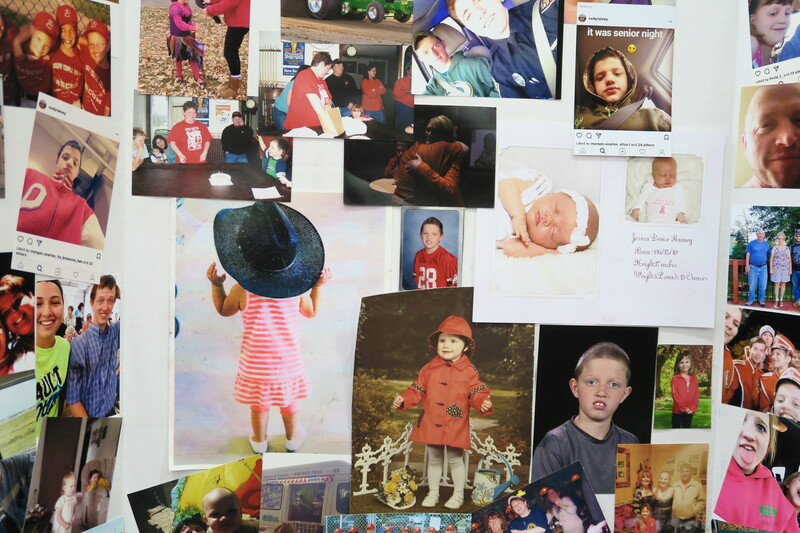 Austin died just two weeks before he was supposed to take his exam. My dad got the phone number for the woman who organized the t-shirts. He’s hoping to get us each one when she does the second order. The line of cars in the procession was very long, led by several firetrucks. They also had a yellow school bus and a transport bus for the Seneca County Opportunity Center in the line, as Jodi had been a driver for both. At the very end was a bright green tractor. A sharp chill had come up by the time we got to the cemetery. 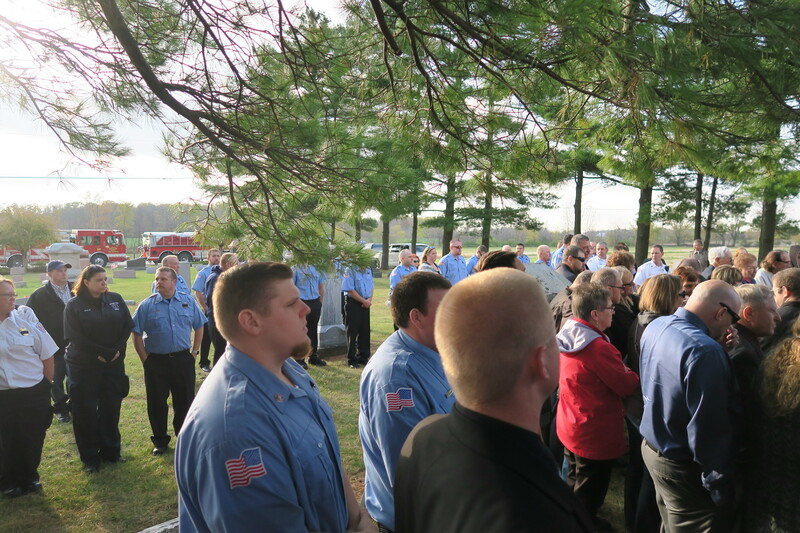 They’d set up the casket underneath a small blue canopy, but it could barely fit a third of the guests in attendance. It was a good excuse to crowd in close to combat the cold. All of the firefighters were still with us, surrounding the group on all sides. 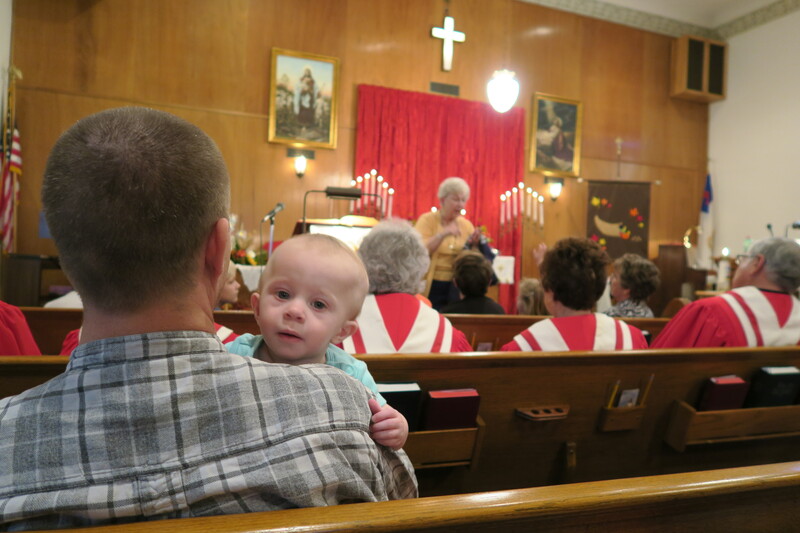 The priest performed a short gravesite ceremony, and the firefighters folded the flag and gave it and a second flag to the paternal and maternal grandparents. More static. I heard the whole crowd intake breath at once, and we all began to quietly weep. There was a very, very long silence. Static. Silence. More loud beeps to call to attention. She said his badge number, 69, would be retired. It was now a memorial to him. I looked over to my left and saw a young man, not much older than Austin would have been, with goosebumps all up his arms from standing in his firefighter short sleeve dress shirt. He had tears on his face. After the service my parents and I drove over to see the burned down house, just a minute or two away from Bob and Sue’s house. They had to erect a chain link fence around it because there are ongoing investigations into the cause of the fire, and to keep people from hurting themselves trying to get close to the wreckage. As bad as I thought the house might be, it was worse. 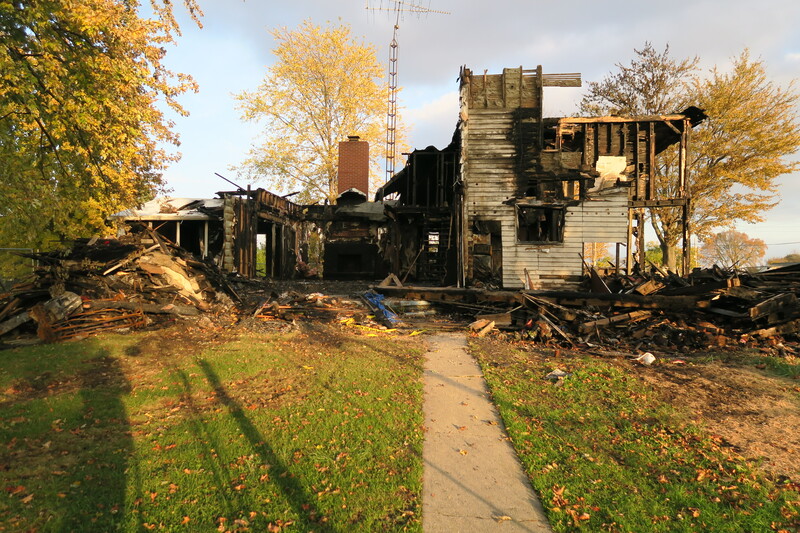 It was just a shell of a home, charred black, with half the walls and none of the roofs. The stairs were still there but most of the second floor was not. Many of the possessions had been completely destroyed, but some were surprisingly intact. There was the melted remains of an oven, half of a sleeping bag, and an entire pumpkin from the porch. We went over to Sue and Bob’s for a large meal with the family. I spent some time cuddling with a few babies, my most distant relations. Aunt Sue gave one of the little girls a bucket Jessica used to use to store her crayons at their house. My cousin Andrew said he never understood how a heart as big as Cody’s could fit in his small chest. My Great Uncle John made fun of my Great Uncle Carl for only being his half brother instead of a full sibling like my grandfather. My cousin Matt asked if I was going to wait another ten years before I came back to see them. I ate two servings of spaghetti and way too many chocolate peanut butter bars. I never had a chance to meet Jessica in person, because she was born after the last time I visited. I have been repeating a memory in my head from the last time I was in Ohio. It was the time my grandfather, Uncle Bob, Jim, Jodi, Austin, Cody and I had to chase a mother duck and her ducklings into the pen for the night. Aunt Sue was laughing at us from the deck because of how terrible we were at it. I wished Jessica had been alive for that. I wished she was a part of that memory. I saw Jessica’s birthdate listed under one of her photos at the gym. I did the backwards math to that moment in the backyard with the ducks. Eight and a half months. I can’t know for sure, but I think Jessica was there. One week ago today my cousin Jim, his wife, Jodi, and their children Austin, Cody, and Jessica all died in a house fire. This morning my parents and I woke up early for our cab pickup at 5:15AM. We took Southwest through Oakland and then on to Columbus. We picked up our rental car and started north. It would take almost two hours to get to Tiffin. We called my Great Aunt Sue to tell her we figured we’d just go straight to our hotel, since it would be so late by the time we arrived. Aunt Sue asked if we had GPS to help us find our hotel. We told her we did, but either she didn’t hear us or didn’t trust it, because she proceeded to explain in detail how to get there from Columbus. She said after we checked in we could call her if we needed directions to the house as well. We told her we’d be fine. We checked in, spent a few minutes freshening up, then got back in the car to drive over to Bob and Sue’s house. Dad had their address in his phone, and he handed it to me as navigator in the front seat. Looking at the map it didn’t seem right. It’s been eight years since I was in Ohio, but I thought they lived farther out of town, and on the other side of the main road. The numbers in the address seemed wrong, too. I’d spoken with my grandmother in California right after we found out about the deaths, and she’d given me Bob and Sue’s address in case I wanted to send a card. I thought I remembered it being different, but since it was still on a post-it note on my desk at home, I had no way to check. Dad’s phone directed us to a set of dark buildings. Dad commented that there didn’t appear to be anyone home. I said with certainty that this wasn’t the right place. The closer we got to Bob and Sue the more I remembered those two weeks I spent with them back in 2009. I texted my boyfriend to see if he could send me the address from my desk, but he wasn’t at home. So we called my grandmother, told her we’d landed safely, and asked if she had her address book handy. As soon as I put the corrected address into my phone it made more sense. 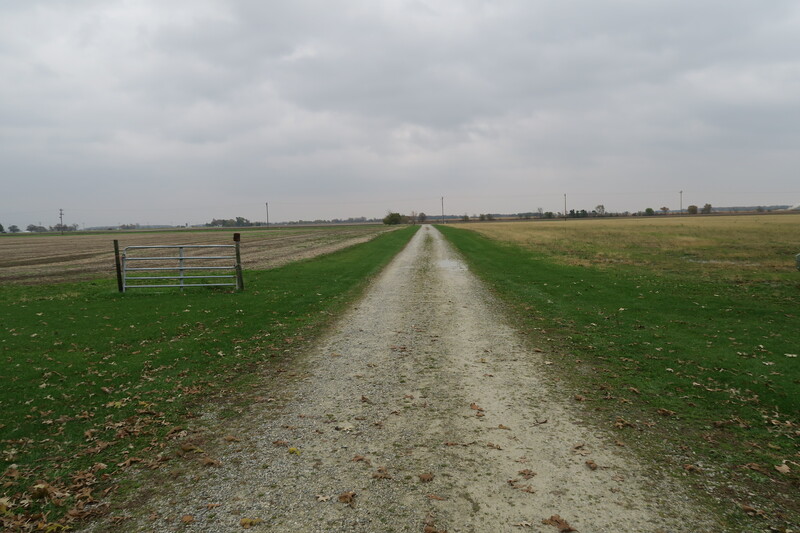 As we approached the cross streets it all looked familiar, even in the incredible dark of rural farmland. I pointed at the house lights up ahead. “Yes, that’s it. That’s their house.” It was exactly as I remembered it. I said hello to my cousin Mike in the driveway. Him and his family were about to drive down to pick up more people from the airport. Inside my other cousin Matt and his wife and baby were about to head out, but stayed for a few minutes to say hello. Sue and Bob and I sat in the kitchen for the next 45 minutes. Easily 35 of those minutes were spent just listening to Sue, which is exactly what I wanted. She told us what we’d learned about the fire, the trouble with the arrangements, how things were going. We went over the plan for tomorrow, and how there were five ministers helping with the funeral service. One was from the UCC church the family attended, one was from the local Catholic Church (Jodi was raised Catholic), one worked with Cody in the community, another had taught Jessica, and as I understand it the fifth minister was there to help with the sound system and the slideshow. Sue explained how they’d been given $2500 from the Red Cross to help with arrangements, but they had trouble spending it at first. 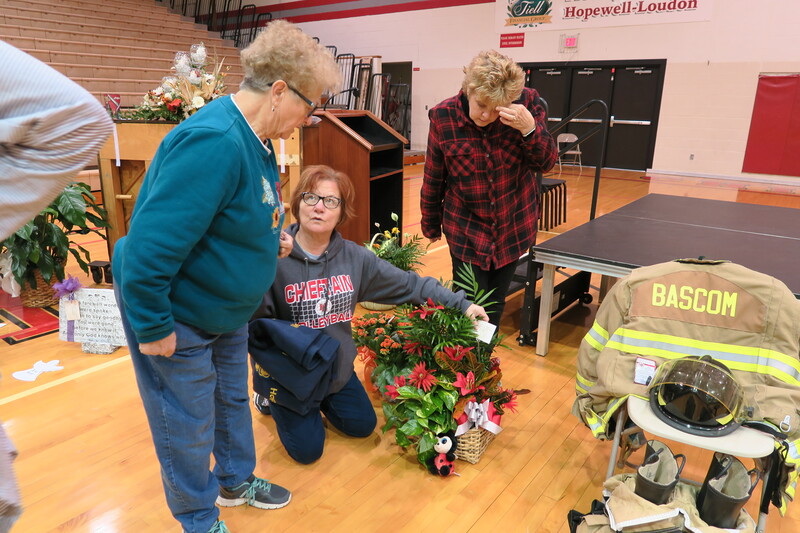 They assumed it would go towards caskets, but since Austin was in training to be a firefighter much of the casket arrangements had already been paid for by the fire department. Another donor had taken care of the plots, someone had donated money for the cemetery tent and sound equipment. The Red Cross money went to the headstone carving, and eventually Bob and Sue had to set up an account at the bank just to accept the donations. Sue says they’ll turn it into a scholarship fund later. It’s very late, I’m very tired. I’m very glad I came back to Ohio. Read a book with a person on the cover. There are video and Instagram challenges that happen during the week, which I’ve done in the past with mixed success. I think this year I’ll keep an eye on them but only bother with the challenges that really excite me. This spreadsheet shows the breakdown of what I’m reading and my plan for how I’ll pace myself. If you want to do the same you can download a copy of the spreadsheet and make it your own. This is my third year doing the challenge, and hopefully my third success! Seven books sounds like a lot, but remember a book is how you define it. Every year I have at LEAST one book that’s very short, such as a play, graphic novel, or children’s book. If you’re participating this year let me know in the comments, especially if you have an Instagram or Youtube channel I can follow.